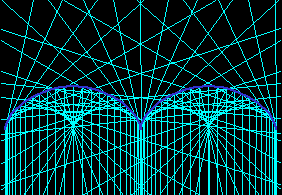 Cycloid (tautochrone, brachistochrone) is a member of cycloidal family of curves. 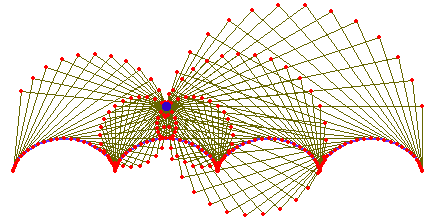 (See: Curve Family Index) Prolate (extended) or curtate (contracted) cycloids are also known as trochoids. In this page, we use the narrowest definition of the term cycloid, defined as the trace of a point on the circumsference of a circle rolling on a line without slipping. In the right figure, c is the rolling circle. P is the tracing point. A is the point of contact with line. PA is the normal at P. E is a reflection of P through A. The locus of E is the evolute of the cycloid. The evolute of a cycloid is another cycloid. The first figure show succesive evolutes of a cycloid. 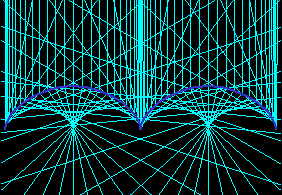 The second connect points on the curve with their center of osculating circles. 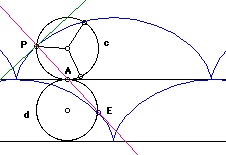 The involute of a cycloid is also a cycloid. Both evolute and involute properties are easily proved by a direct application of the formula and simplify the result. The radial of a cycloid is a circle.